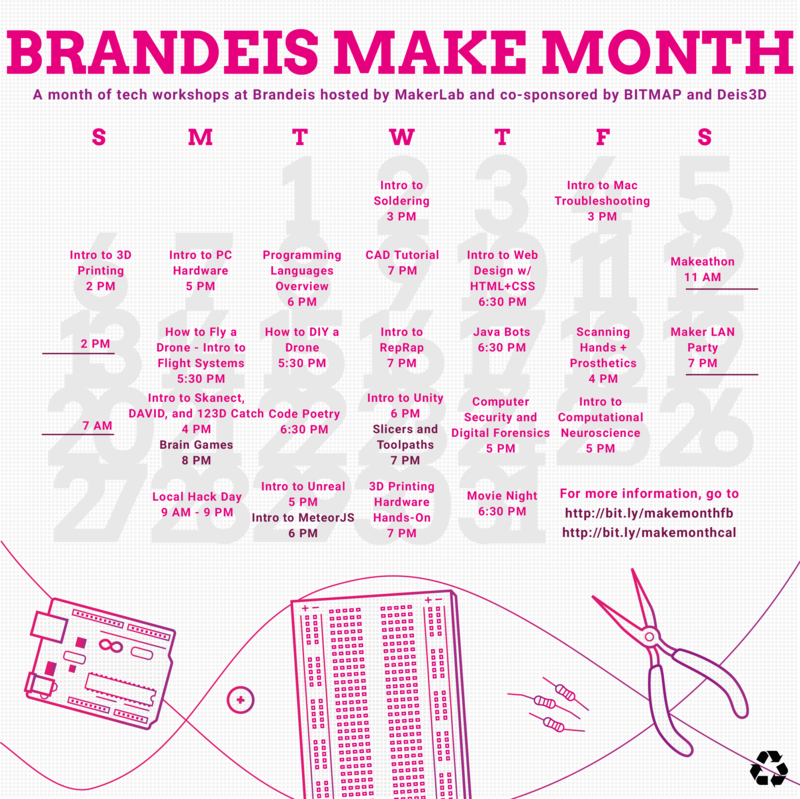 This March, the technology clubs at Brandeis are teaming up to organize MakeMonth - a month of tutorials, workshops, and hack events. 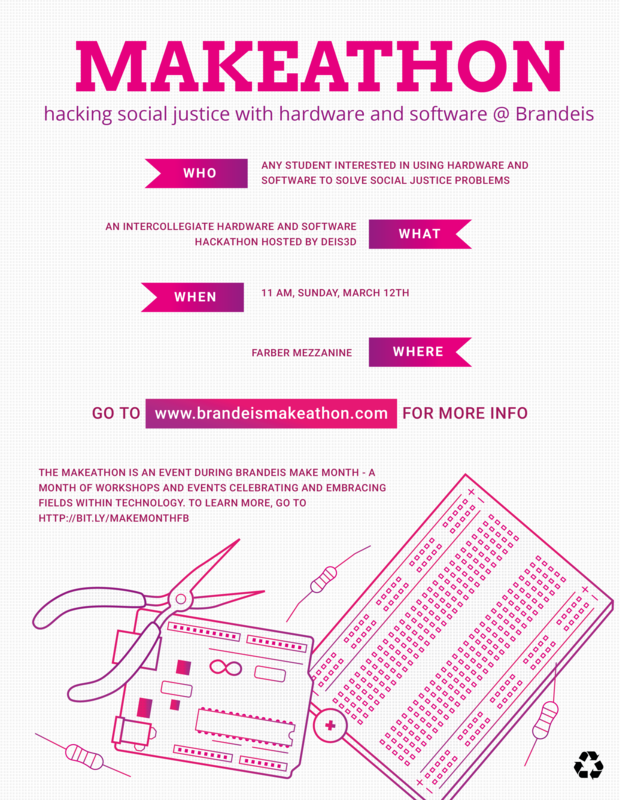 The largest and first hackathon at Brandeis is Codestellation, which occured last Spring (March 2015) and last Fall (November 2015). Both years, we had around 100-150 attendees. Codestellation is a joint software/hardware hackathon for mainly Boston-area students. We initially started planning the hackathon my freshman year, in 2013, and ultimately decided to focus on a spirit of collaboration and learning as the driving force behind the hackathon. Deis3D, the 3D printing club at Brandeis, has been running the Printathon - a hackathon focused on 3D printing solutions to social justice problems - in Spring 2015 and Fall 2015 as well. Attendance was around 20 - 30 students both years. As an organizer of Codestellation and a close collaborator for the Printathon, I saw that it was clear that both clubs needed to rethink our goals for the future. While Codestellation and the Printathon were successes, we wanted to expand our reach and really grow the tech community at Brandeis with more than just hackathons. One of the major problems with Codestellation/the Printathon/hackathons in general is that they’re too much of a time commitment for students, and attendance can drastically vary depending on which students have midterms or assignments due after the hackathon. We were putting too many of our hens in one basket - by spending most of our time planning one huge event, we missed out on fostering a community that might not have been able to attend that event. MakeMonth is our solution to this problem. Instead of focusing on one large event as the focus of the semester, we’re teaming up with all the other tech clubs to offer many small tutorials, hack events, and workshops throughout the month of March. With more low-key, non-stress events, we’re expecting our community to grow with students that we may never have been able to reach before. I’ll keep the list updated as stuff comes up. The Makeathon is a yearly competition wherein teams will be given a toolbox of hardware components and tasked to solve challenges using the hardware given. Solutions will include a hardware and software component, and problems are mainly challenging but fun problems centered around social justice. The Makeathon is co-sponsored by Deis3D and BITMAP. With creating the branding and art for MakeMonth and the Makeathon, I wanted to keep the spirit of fun and creativity at Codestellation and incorporate that into the promo materials for MakeMonth. The color (hot pink and purple) and art style (line drawings of electrical components on graph paper) were chosen to convey creativity and technicality - both of which are needed for anyone looking to innovate. I’m also hoping that, through the fun and inviting nature of the posters, we’ll get more than just the typical “tech bros” at our events. The following are, respectively, a calendar of events to print out and distribute around campus, and a poster for the Makeathon. I also did the website.